Photographs and text by Jacqueline Banerjee. You may use these images without prior permission for any scholarly or educational purpose as long as you (1) credit the photographer and (2) link your document to this URL in a web document or cite the Victorian Web in a print one. Click on the images to enlarge them. The Dundee parish Church of St Mary's, with the medieval tower to the left. The church's east end is on the extreme right, though largely hidden here by a tree. Church of Scotland: St Mary's, Nethergate, Dundee, by Burn & Bryce. 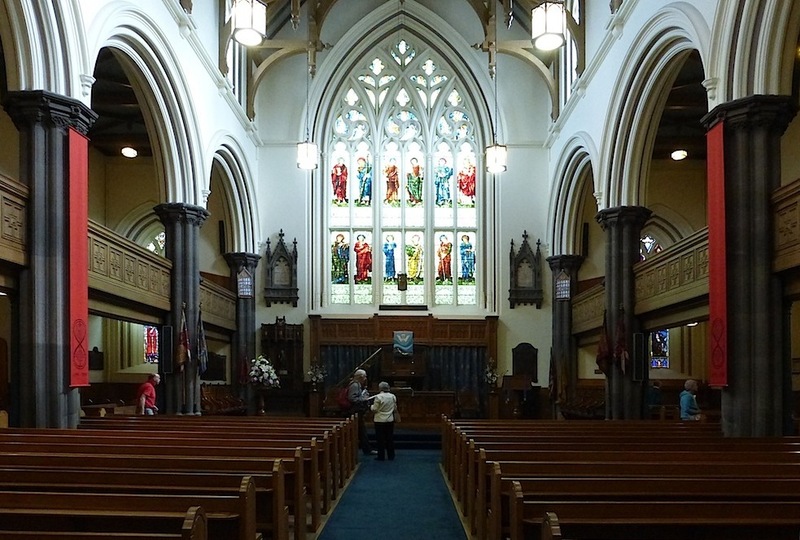 Built 1842-44, of polished ashlar and in late Gothic style, this is part of an unusual church complex in the heart of Dundee, with considerable Victorian interest. The whole complex stands on the site of the medieval church of St Mary, only the tower of which remains. The parish church itself, shown above, was rebuilt at the east end after a disastrous fire of 1841. Burn & Bryce was the partnership of William Burn (1789-1870), who had been a pupil of Sir Robert Smirke, and had a large practice in the 1830s; and David Bryce (1803-1876), originally Burn's assistant. Bryce was left in charge when Burn was working in his London office. Their partnership lasted until 1849, by which time "Bryce's Edinburgh practice was ... busier than Burn's in London" ("David Bryce"), and the pair went their separate ways. Left to right: (a) A closer view of the south face of the tower, restored by Sir George Gilbert Scott. 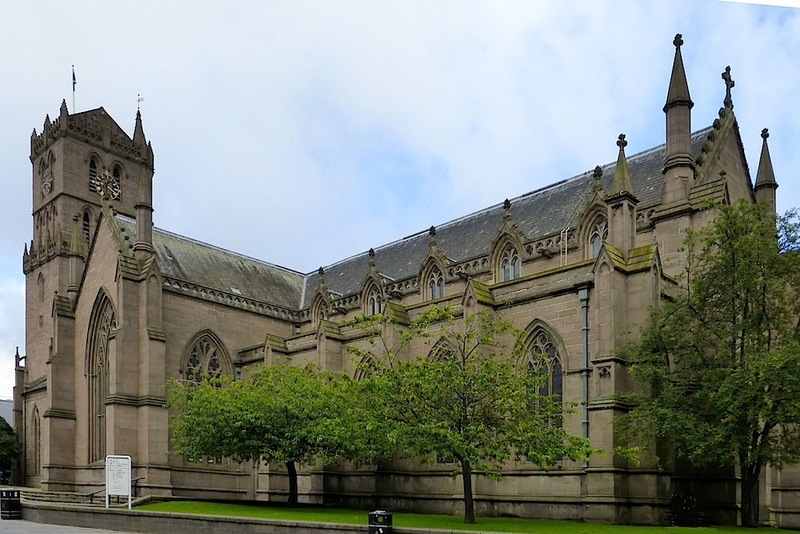 (b) The adjoining Steeple Church, a Georgian rebuilding which was was already there when Burn & Bryce built St Mary's. (c) The same southern elevation, with the tower on the left, then the Steeple Church, and then the former St Paul's (South) Church, now the Mary Slessor Centre; the beginning of St Mary's can be seen on the extreme right). 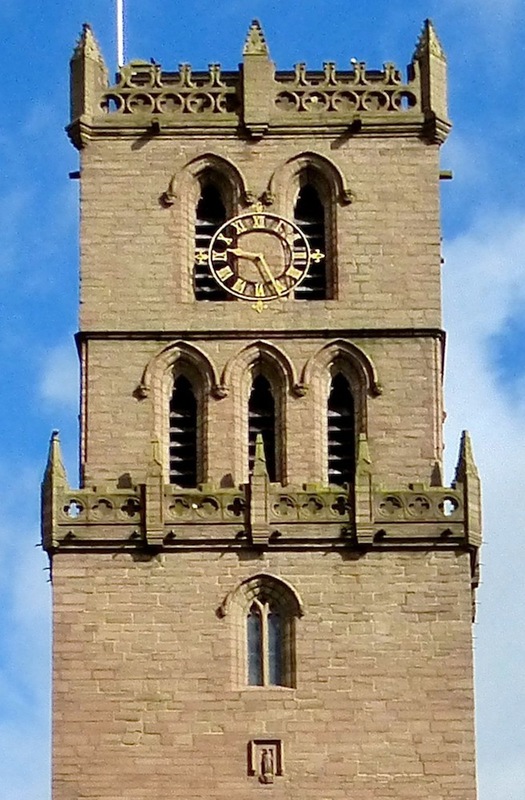 The tower itself is the oldest surviving building in Dundee, having served not only as a belfry and a clock tower, but as a watch-tower and prison in difficult times (see "Dundee Parish Church (St Mary's)." Long before Burn & Bryce designed the new St Mary's, there was already a congregation in the old west end adjoining it (hidden from angle shown in the top picture). This was aptly christened the Steeple Church. Then, not long after St Mary's was completed, another congregation was fitted into the large middle part: St Paul's (South) Church filled the "transepts" and the beginning of the "nave" section. This was built in 1846-47, again by Burn & Bryce. 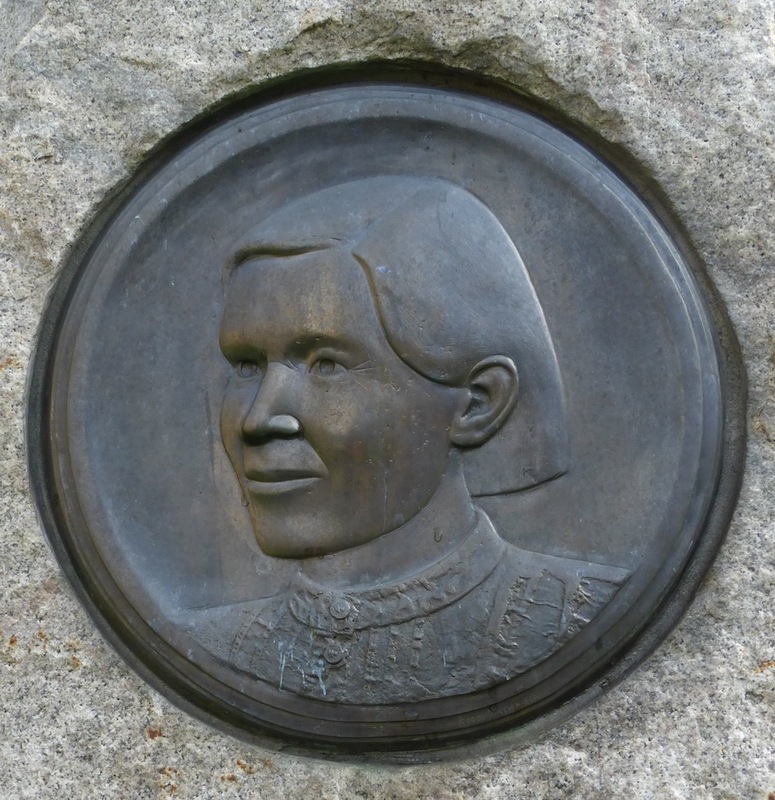 This middle part, however, has now been converted into the multi-purpose Mary Slessor Centre, named after the Victorian missionary who once worked in the jute mills in Dundee. 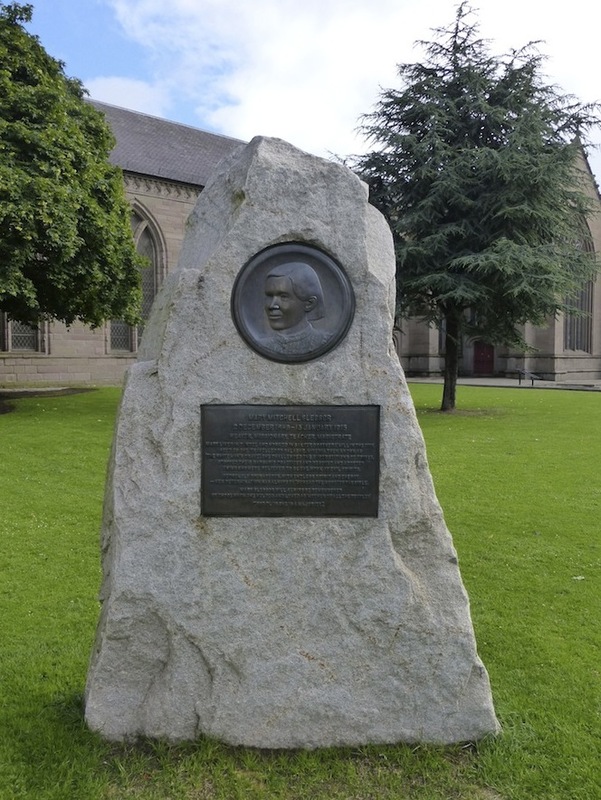 Outside the Centre can be seen a memorial to Slessor which was unveiled in 2015 on the centenary of her death. To complete the picture for Victorianists, the old tower itself was extensively restored by George Gilbert Scott in 1871-73. With its fine hammerbeam roof, clerestory, panel-fronted gallery, arcades, and striking east window, St Mary's is still a complete, capacious and impressive church in itself. The roof pendants and gallery panelling are Neo-Jacobean (Gifford 91). Left: The communion table, with the pulpit behind it. 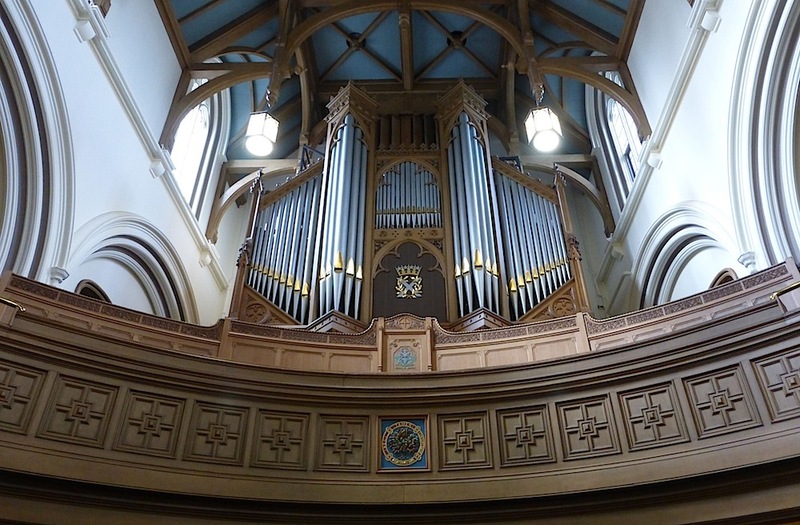 Right: The organ. 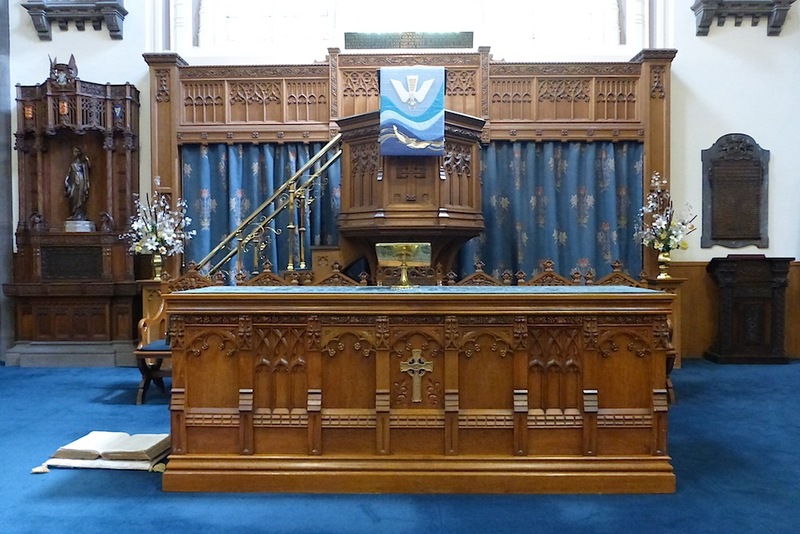 The communion table dates from 1884 (although it has been extended in the same style in more recent years) and the organ from 1865-66 (originally by the firm of Foster & Andrews, although this too has been "improved," and twice rebuilt [Gifford 91]). 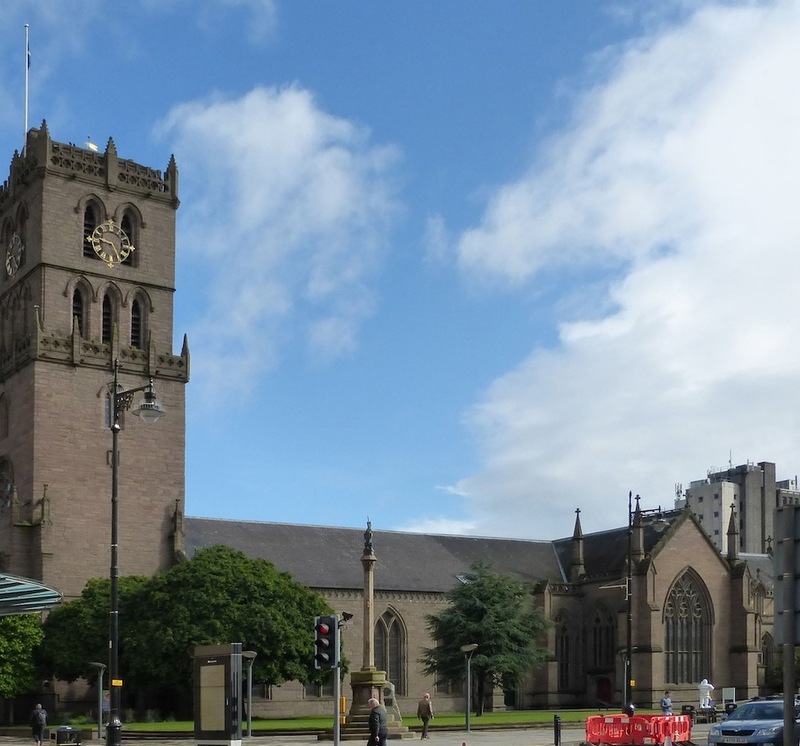 From the structure itself to its fittings, St Mary's has a long and complex history, which is itself deeply involved in the history of Dundee as a whole. 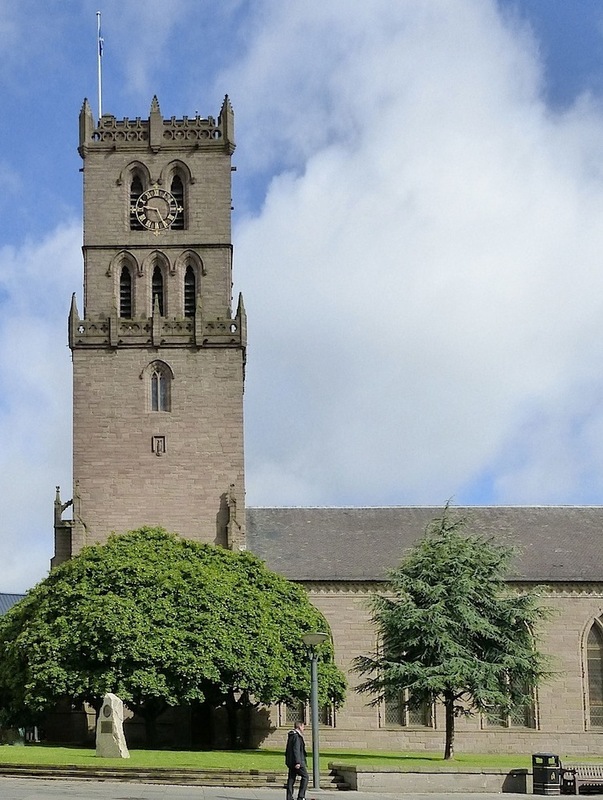 The church's own website points out that the tower is also of "national importance as a splendid example of the late 15th century Gothic style in Scotland." The Resurrection, by Cottier & Co.
"David Bryce" (Basic Biographical Details). Dictionary of Scottish Architects. Web. 1 December 2016. Dundee Parish Church (St Mary's)." Dundee St Mary's. 1 December 2016.